Phase Separated Composite Film (PSCOF) is formed hybrid structure in the cell. Using the property of compressing LC layer, this development can be used in making thinner cell to make its photoelectric property more plastic. The employment of the flexible display, Phase Separated Composite Film is regard as polymide. Because of its low temperature in the process, we can avoid the deformation of plastic substrate baking in the high temperature. Furthermore, polymer layer have greater toughness to the external force to protect bending substrate, which results in destroying the LC layer effectively. A reflective cholesteric liquid crystal (CLC) display is demonstrated using Phase Separated Composite Film (PSCOF) method. 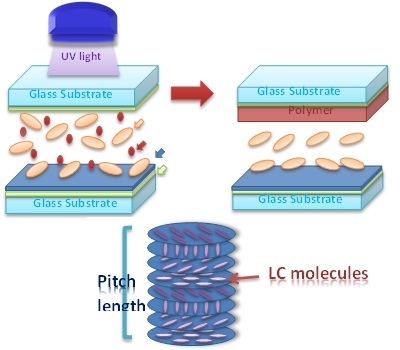 After using the UV illuminate the polymer to let it polymerizes on the top substrate, the LC layer is formed between the polymer and the underneath substrate. As a result, PSCOF can be used to the thinner cell to make the flexible display owing to the flexible polymer. The multi-domain PSCOF-based CLC display is easy to fabricate and suitable for use in a flexible plastic display.